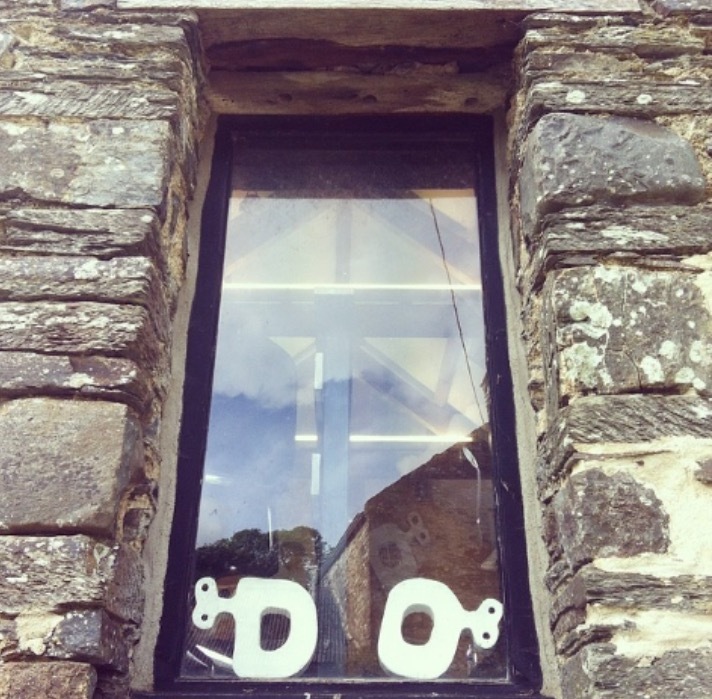 Here’s a little story about how my interest in sustainability in my community took me to the Do Lectures, where I was inspired by Craftivism. 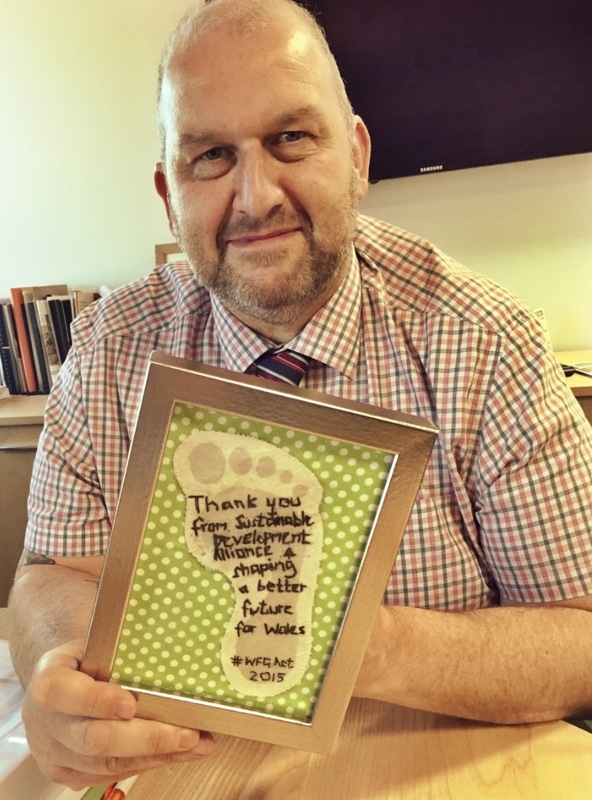 Over a year later I used the Craftivism Footprint project to thank a Welsh Minister for his support in passing a remarkable piece of legislation that will enable Wales to reduce its footprint on the planet. A few years ago I was part of the British Council’s Climate Champion initiative. This brilliant programme invested in people to promote and share international knowledge on climate change activism and sustainability. 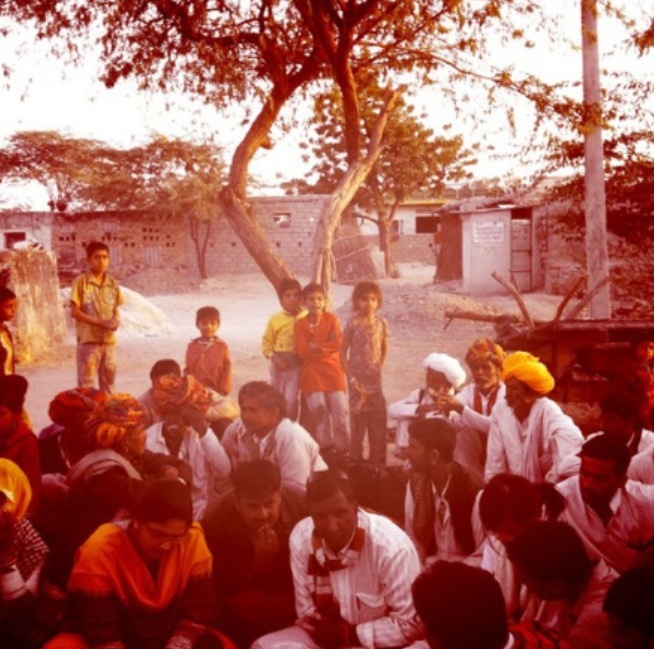 As well as supporting me to do community level projects through Cardiff Transition Towns, the British Council took me to Rajasthan to look at sustainable water management systems. 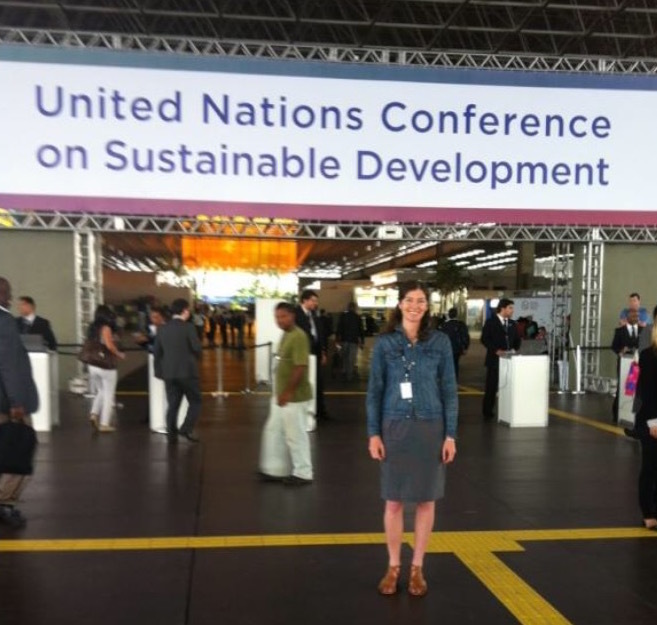 I was also fortunate enough to act as a representative at the Rio + 20 conference. These trips etched into my heart and mind the importance of sustainability. We are all connected by one planet. What we consume in Wales is produced using the planet’s resources, often by people in poverty with costs to their local and the global environment. Climate change is one of the main impacts from this high consumption lifestyle and the impacts of a changing climate will make the majority of people in poverty’s life even more difficult. Through the British Council programme I met Mike who told me about the enigmatic Do Lectures. It was something I wanted to find out more about so volunteered for the 2014 summer intake. In a nutshell, the Do Lectures showcase sustainability done by stand out people – entrepreneurs, independent thinkers and mavericks. They share their stories and inspiration for action. And yep, they are definitely worth checking out. It was at the Do Lectures 2014 that I was lucky to hear Sarah Corbett speak with passion and humour about her Craftivism journey. I came away from that week in beautiful Cardigan inspired and wondering how I could use some of that DO mentality in my life and hopefully ‘stitch’ some craft into it at the same time. One of the speakers in the 2009 Do Lectures was Jane Davidson, former Minister for the Environment in Wales, who spoke about the Welsh Government’s sustainability journey. Jane talks about how government can enable a sustainable country to help progress the idea for ‘One Wales, One Planet’. This approach recognises that our country’s footprint on the planet is much more than it can sustain and so we need to reduce our impact by integrating that concept into all government decisions. All these experiences came together a couple of months ago when I wanted to say thank you to Carl Sargeant, the current Minister with responsibility for the environment in Wales, for helping to pass the Well-being of Future Generations Act. This piece of legislation started off with the ‘One Wales, One Planet’ principles but went through a lot of ‘politics’ and at one point was very far away from what was originally intended . Carl Sargeant helped take it back to the place it needed to be and it became a ground-breaking piece of legislation that puts sustainable development at the heart of Wales’ decision making. We are one of the few countries in the world to pass such a piece of legislation and it is being held up across the world as an exemplar, including by the United Nations. We are very proud of this in Wales and want to promote it as far and wide as possible. Many people within the NGO sector in Wales have worked so hard over the last few years to make this a strong and effective law. We wanted to express thanks to those that helped pass this piece of legislation. When I heard that the Minister was into crochet my mind started connecting… sustainable development, Do Lectures = Craftivism Footprint project. It seemed a good combination so I embroidered a ‘thank you’ message for our Minister. As a sewing novice, it took me A LOT of hours and although it’s far from a masterpiece, I hope it shares our hopes and thanks. I also hope it makes a nice end to this little story of mine which of course is part of a much bigger one – being mindful of and working hard to manage our footprint for the future of this beautiful planet. Blog by Jessica McQuade: You can follow Jess: here.